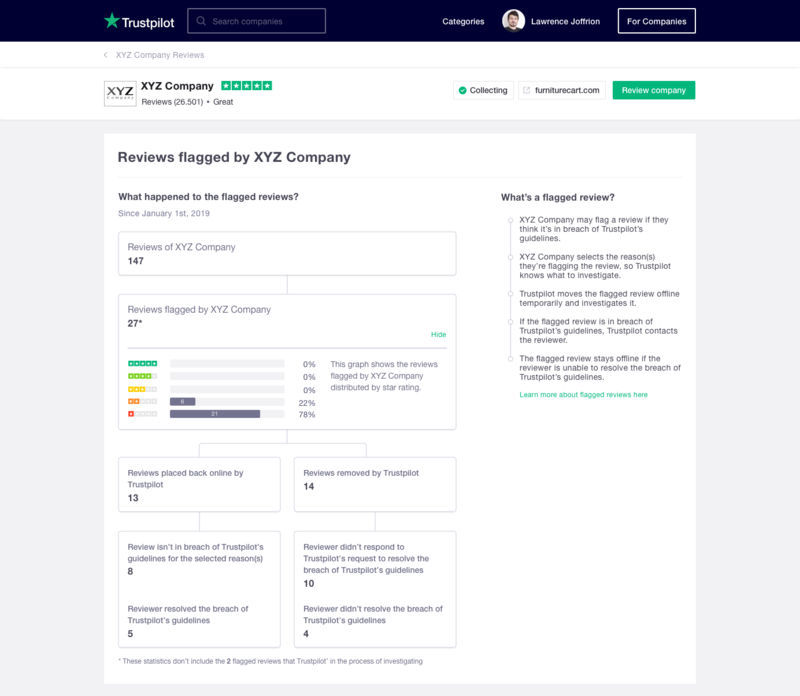 To ensure that Trustpilot’s platform has as many genuine and constructive reviews as possible, we allow companies to flag reviews they believe are in breach of Trustpilot’s guidelines. To avoid misuse of the flagging function and maintain a balanced platform, Trustpilot investigates every flagged review, and we only remove reviews that are in breach of our guidelines. Where can I see a company’s flagging activities? How many reviews has the company flagged on this profile page? How many flagged reviews has Trustpilot put back online and how many have we removed? Have reviews been flagged for valid reasons? What are the star ratings of the flagged reviews? Read more about what happens if your review is reported. What flagging data is displayed? The total number of reviews flagged by the company on the public profile page since January 1st, 2019. The number of reviews that were flagged on the company profile page and subsequently placed back online by Trustpilot. The number of flagged reviews that Trustpilot has placed back online because our investigation found no breach of guidelines for the reasons reported by the company. The number of reviews where the reviewer resolved the breach by addressing the reason reported by the company, e.g. removing coarse language. The number of reviews that were flagged by the company, investigated by Trustpilot, and subsequently removed for being in breach of our guidelines. The number of flagged reviews where the reviewer didn’t respond to Trustpilot’s request to resolve the guideline breach. The number of flagged reviews where the reviewer was not able or willing to resolve the guideline breach.